Spring officially began on Tuesday and though it may not feel like the season right now, we still have a lot to look forward to in Lake County once it does! As the days continue to grow longer and the temperature begins its rapid ascent, we are sure of one thing; great Lake County fun and entertainment. For a full list of such activities, you may continue here. Speaking of entertainment, Ravinia Festival officially announced their top-notch lineup on the 14th, and guess who has your complete guide to the festival? How is your bracket doing? Don’t feel bad, no one in America still has a perfect bracket anymore. However, you can still enjoy the fun the March Madness brings all throughout the county at these fine establishments. You can even root for your most local team, the Loyola Ramblers and the internet celebrity Sister Jean. Getting right back to it, take a break from the Spring cleaning and continue reading for the top things to do this weekend March 23-25. Visit Libertyville for the grand opening of the Bess Bower Dunn Museum of Lake County. 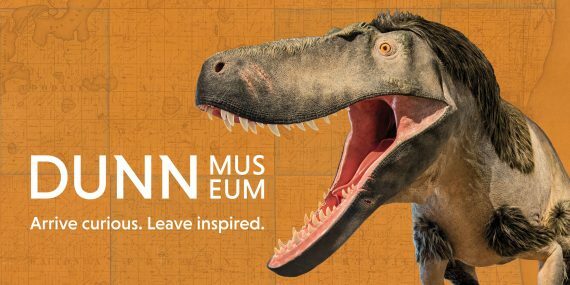 The Lake County Forest Preserve museum is showcasing their Dryptosaurus dinosaur and attendees can meet the Chicago paleoartist Tyler Keillor who recreated the life-size replica with Yale University. The predatory dinosaur dwelled in Lake County approximately 67 million years ago and is a 20-foot-long bipedal. Attendees are encouraged to take a tour of the new museum, enjoy drop-in activities and peruse through the gift shop. Saturday, March 24; Guided tours every two hours from 10 a.m.-4 p.m. Meet and greet:11 a.m.- 1 p.m. Free admission. Bess Bower Dunn Museum, 1899 W. Winchester Rd., Libertyville. This is the final weekend to visit The Orchid Show at Chicago Botanic Garden. The Glencoe show is the only one of its kind in the Chicago area featuring over 12,000 brilliantly beautiful and unusual orchids from around the world. The show is located in the Regenstein Center. Friday-Sunday, March 23-25; 10 a.m. – 4 p.m. Admission $8-$12. Chicago Botanic Garden, 1000 Lake Cook Rd., Glencoe. Suit up and enjoy Volo Auto Museum’s Princess and Superheroes. Dozens of popular superheroes and princess are in attendance at noon and 3 p.m. Children 13 and under in costume will get free admission with an adult Visitors can create a photo memory in the Batmobile with a $5 donation. Saturday, March 24; Noon-3 p.m. Admission: Children 13 and under are free with costumes. Adult admission: $15, Senior admission: $13. Children Admission: $9. Children age five and under: Free. Volo Auto Museum, 27582 Volo Village Rd., Volo. This is the final weekend to see “Company” at the PM&L Theatre in Antioch. The original production of this musical comedy was nominated for a record-setting 14 Tony Awards and won six. “Company” is a concept musical composed of short vignettes, presented in no particular chronological order. Friday-Sunday, March 23-24; Friday-Saturday 8 p.m. Sunday 2:30 p.m. Admission $10-$18. PM&L Theatre, 877 Main St., Antioch. Leave the kids at home for a night of humor at Buffalo Creek Brewery this Saturday. Chicago comedian Jay Harris performs his knee-slapping act at the Long Grove hang-out from 7- 8:30 p.m. Pints of Burning Red are discounted $1 for the evening as the hilarity ensues. Saturday, March 24; 7 – 8:30 p.m. Admission: $20 in advance, $25 at the door. Buffalo Creek Brewing, 360 Historical Ln., Long Grove. For even more events and happening other than the top things to do this weekend March 23-25, continue here.